We’ve all been there. 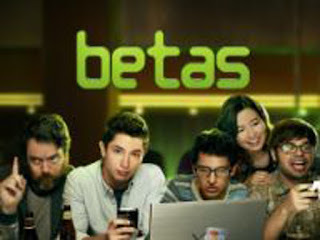 Being the genius techy with the billion dollar app idea and... OK, maybe we haven’t, but there’s still a lot that I connected with in the half hour pilot of Betas. Basically it’s like early Big Bang Theory but with app programmers instead of physicists. There’s four guys in the tech startup team who are working out of a communal workspace at Mind Hub until they can find an investor for their app. Nash is the tech genius who has written the app BRB, which is for “connecting with people you’ll get on with in the real world,” by hacking into Facebook and other social media sites to harvest data and compare the interests of people in your current vicinity. Neat idea, if a tad illegal. Only he doesn’t have any real-world social aptitude or empathy, is highly resistant to change but wants out of the childish melee of the communal workspace and is completely against presenting work that isn’t absolutely perfect. So he’s essentially Sheldon. Or me. Ah. Oh, apart from the fact that he hates Billy Joel - how dare he?! Then there’s the leader of the e-startup team, Trey. Techy but also confident and able to communicate, he’s the one that gets “out there” to try and get them the investment they need to push the business on to be as successful as their nemeses Valet Me, the parking space locator app team. In the pilot episode this means blagging his way into the party of a tech guru (brilliantly and eccentrically played by Ed Begley Jr) to pitch the BRB idea. The other two guys in the team are Mitchell, who spent the pilot episode not being able to talk to a girl to get her phone number, and Hobbes who just enjoys taking the piss and messing with people's lives in a wonderfully cynical way. However, it seems not many people agreed with me. Even though Betas got commissioned for a full series from this pilot it never got picked up for a second one. So I guess, like so many other things (see: Firefly), it will become a cult thing and ripe for a remake in 20 years or so. Get in there and watch it now, before it becomes cool.